The U.S. Department of Interior’s Bureau of Ocean Energy Management (BOEM) announced on Friday, July 18, that it would begin considering applications for permits to conduct geological testing for oil-and-gas (O&G) reserves in federal waters along a wide swath of the Atlantic coast stretching from Delaware to eastern Florida. The announcement was made in conjunction with another, made the day before, that more than 21 million acres of O&G reserves in the Gulf of Mexico will be available for leasing – in other words, drilling – beginning in late August. This section of the Outer Continental Shelf (OCS) of the Atlantic coast has been off-limits to any O&G exploration activity since the early 1980s, following a 1982 congressional moratorium on O&G leasing off the west coast and in the eastern Gulf. The OCS is an underwater landmass, falling under federal jurisdiction, on which much U.S. offshore drilling is conducted. Parties must obtain federal permission (leases) before exploratory testing or productive drilling operations on the OCS can begin. Although BOEM’s announcement is no guarantee that drilling will be permitted on the Atlantic coast, it has nonetheless aroused concern amongst environmentalists. 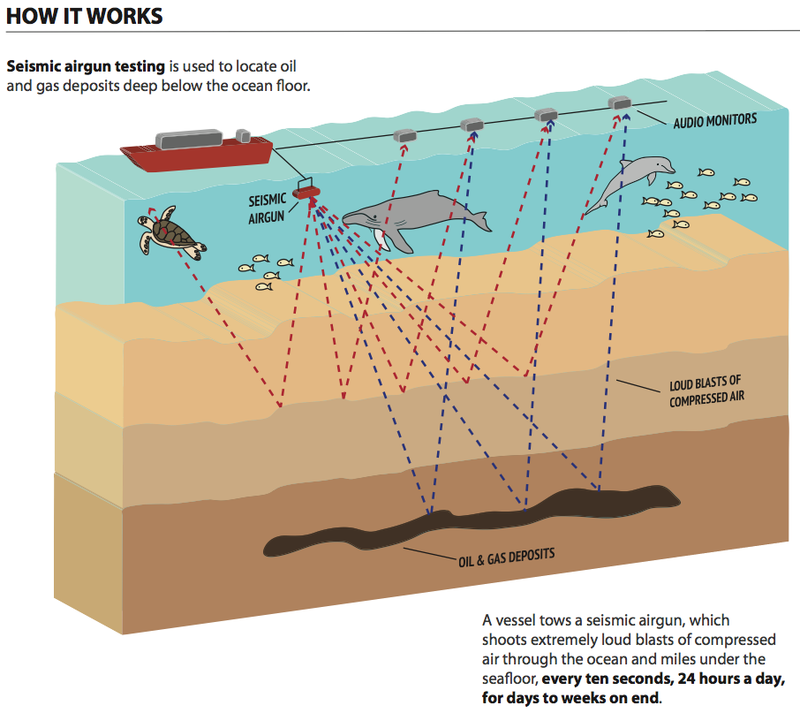 Geological testing of this sort is typically conducted with seismic air cannons, which allow surveyors to take a “sonogram of the Earth,” but are also known to cause significant damage to sea life. These cannons fire sound waves every ten seconds at levels up to 190 decibels – over 100,000 times louder than a jet engine – and are typically operated for weeks at a time, drastically increasing undersea noise pollution. Not only do these sound waves cause physical harm to sea animals, but the extra noise pollution can also disrupt the mating and feeding patterns of animals that rely on echolocation, such as whales and dolphins. The last time the government proposed opening this section of the Atlantic coast to O&G exploration was in March 2010, when the Department of Interior was working on its 2012-2017 offshore lease sale plan. However, the proposal was abandoned after the Deepwater Horizon oil-drilling rig burned and sank in the Gulf of Mexico on April 22, 2010. A blowout the size of the Deepwater Horizon could devastate the coastal economies of multiple East Coast states. 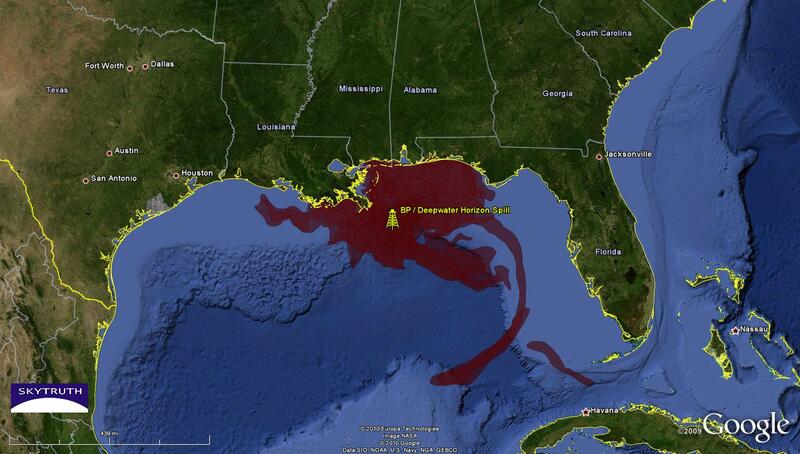 Map view of the extent of the Deepwater Horizon spill. Image courtesy of Flickr user Sky Truth. Documents obtained through the National Institute on Money in State Politics (NIMSP) indicate that O&G lobbyists have indeed been busy in the seven states whose coastlines comprise the area of interest, contributing vast sums of money to each state’s governor and lieutenant governor, local legislators and representatives in Congress. Since 2006 – the earliest that any of the states’ current governors or lieutenant governors were elected – O&G interests have contributed nearly $900,000 in total to these politicians’ gubernatorial campaigns. Top recipients include Gov. Pat McCrory (R-NC), who received about $230,000; Gov. Nathan Deal (R-GA), who received nearly $190,000; and Lt. Gov. Casey Cagle (R-GA), who received just over $180,000. Only two politicians in this group did not receive donations from O&G interests: Lt. Govs. Carlos López Cantera (R-FL) and J. Yancey McGill (D-SC). With the potential looming for massive economic expansion in Mid-Atlantic and Gulf Coast states, McCrory, Gov. Terry McAuliffe (D-VA) recently joined other coastal governors on the oil industry supported front group, the Outer Continental Shelf Governors Coalition (OCSGC) and worked with the Department of the Interior to develop rules regarding expansion of drilling on the Atlantic Outer Continental Shelf (OCS). To facilitate the development of plans for the permission of geological testing, these governors formed the OCSGC, chaired by McCrory. Other members of OCSGC include the governors of Alabama, Texas, Louisiana, and Alaska – states that are also well known for drilling. McAuliffe joined the mostly-Republican OCSGC in February according to the Washington Post, following a meeting with McCrory and Interior Secretary Sally Jewell. Membership in OCSGC costs just $1,000 a year. According to the OCSGC website, the Coalition is basically run by the Consumers Energy Alliance, who’s membership includes multiple oil and natural gas companies and trade associations including ExxonMobil, Chevron, Shell, BP, Hess, Marathon and Range Resources, among others.